Last week, I was lucky enough to see an advance screening of the movie! It looked my expectations in the eye and said, "Oh, you think you know how good this movie will be? Hold my beer." I had hoped going in that it would be adorable like the book was adorable, but I honestly didn't expect to love it as much as I did. I seriously loved it so much! Yes, it met the Adorable factor I was hoping for, that was in the book and raised it a level. But it was also really funny. I didn't expect to be cracking up as much as I was. I laughed and I cried and it made me nostalgic for my group of high school friends. You know, the ones that you'd just drive around town with listening to music and talking? The ones who knew you better almost as well, if not better, than you knew yourself? 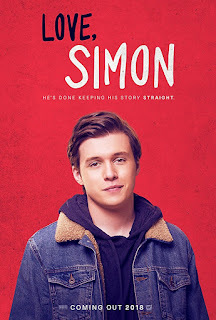 Simon's friends were all amazing in this and their relationship was perfect -- it felt genuine and not forced in the slightest. Jennifer Garner and Josh Duhamel as Simon's parents were also killer. I think if you've read the book and you liked it, then you will like this movie. It did a good job of sticking pretty closely to the book. But I also really think this will be one of those book-to-movies that can stand on its own. I think it will be able to attract fans and viewers outside of those who have read the book, and that these fans will come to know and love the book through the movie first. Love, Simon comes out March 16th in the U.S. and I already told a friend I would go with her and see it again. And I already can't wait.